CarGurus has 50,571 nationwide Tacoma listings starting at $3,200. With nearly twenty variants to choose from, the 2008 Toyota Tacoma is one of the most flexible trucks on the market. The midsize Tacoma's considerable variety is created through a myriad of engine, drivetrain, bed-size, cab-layout, and trim configurations. The Tacoma is carried over from 2007, and it received a comprehensive redesign for 2006. The Tacoma has been praised by drivers and reviewers alike for its high degree of configurability and versatility, the availability of a potent V6, excellent build quaility and reliability, a variety of option packages, and off-road prowess. Many Tacoma shoppers and buyers have expressed the desire for a better stock stereo, more standard features on the lower trim levels, more refined engines, and the availability of a sunroof. Yet reviewers agree that despite a few insignificant nitpicks, the Tacoma is probably the most well rounded midsize pickup on the market. The Tacoma is available with either a 2.7-liter, 159-hp inline four or a 4.0-liter, 236-hp V6. The four cylinder may be paired with either a four-speed automatic or a five-speed manual, while the V6 upgrades to a five-speed automatic or a six-speed manual. Properly equipped V6 models can tow 6,500 pounds. The Tacoma is offered in three cab sizes: Regular, Access, and Double. The Regular Cab models feature bench-style seating for three. The extended Access Cab adds suicide rear doors and two rear jump seats. The Stretched Double Cab includes four full-size doors and a cabin comparable in size to the Camry sedan's. Most trims are available with a longer bed, extending the standard 60-inch bed by 13 inches. Features are determined by the cab size, with the Regular Cab models coming sparsely equipped, while Double Cab models get air-conditioning, an overhead console and a six-speaker sound system, keyless entry, full power accessories, and upgraded upholstery. Tacoma options are bundled in groups: The TRD Off-Road package includes fender flares, 16-inch alloy wheels, more exterior chrome trim, a heavy-duty suspension, a locking rear differential, skid plates, and sport seats; the TRD Sport performance upgrade includes 17-inch wheels, a hood scoop, sport suspension, and sport seats; and the SR-5 package includes a chrome grille shell, color-keyed wheel flares, privacy glass, foglights, a leather-wrapped steering wheel, and cruise control. 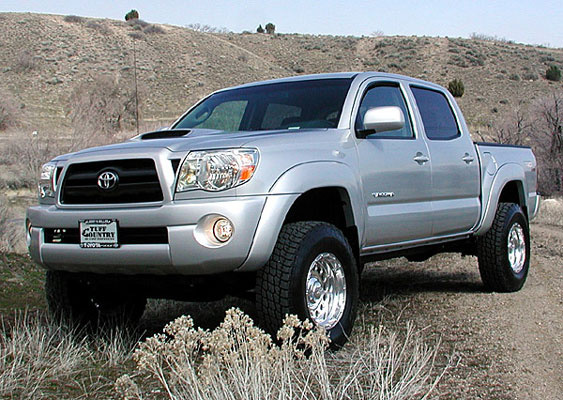 What's your take on the 2008 Toyota Tacoma? 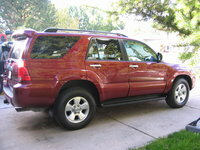 Users ranked 2008 Toyota Tacoma against other cars which they drove/owned. Each ranking was based on 9 categories. Here is the summary of top rankings. Have you driven a 2008 Toyota Tacoma? Replaced thermostat,radiator cap, flushed and back flushed radiator and heater core, lots of heat from heater in cab,motor still gets overheated. Help. Any suggestions. ONLY WHEN ACCELERATING & DEACCELERATING ,JUST BEFORE AN OIL CHANGE. GOES AWAY AFTER OIL CHANGE.